Our writer details her journey with PCOS. By the time I was 14 years old, I could grow a better beard than any boy in my class and if I was a boy this would have been something to be proud of – a mark of my budding manhood. But therein lies the issue: I am not a boy but rather I was a fragile teenage girl who just wanted to blend into the background. Turns out that’s hard to do when you’re 14 years old, barley 5 feet tall, a size 16 and have a bright beard to match your too bright hair. Yet never had it entered my mind that there was something bigger behind my unconventional appearance, nor did it enter the minds of my parents, who always insisted I was just as pretty as the girls I stared at in envy. It was only when I needed a blood test that my doctor told me that I had Polycystic Ovarian Syndrome (PCOS), and that this was the cause of my excess hair and weight. PCOS being a condition in which testosterone levels are raised in women resulting in excessive hair in unusual places, excessive weight, infertility, acne and depression among other things. I left the doctors aware that there was nothing I could do to cure this, no way to get rid of the hair permanently, a prescription for birth control (in an attempt to force my body to have a period) and the worst revelation of all… I could not conceive a child without medical assistance. All of this because my body produces higher than normal level of testosterone, meaning that my body starts to make eggs but is incapable of finishing the process, creating cysts on my ovaries. I felt like my body had failed me, I felt like I had somehow failed at being a girl. At 14 years old I couldn’t help but feel like everything I had planned out for my life had already come crumbling down around me. Now, I realise how dramatic I was; yes, everything wasn’t going to be as simple as I thought, but in the grand scheme of things nothing had really changed. Yet that was the issue: nothing changed. I expected the pill to help with the hair and the weight and magically make me more confident, but it didn’t, all the diagnosis had done was make me even more aware of how I looked, resulting in me being even more self-conscious than before. I would no longer wear my hair in a ponytail, I wouldn’t stand in front of people who were sitting down (out of fear that they could see the hair growing under my chin and around my neck) and I became more and more obsessed with my weight. While this was like every other teenage girl my age, I didn’t just feel ugly or fat, I felt like a failure as a woman and I felt like that would never change. Other girl’s puberty would result in their becoming just as beautiful on the outside as they were on the inside, my puberty would just highlight my differences. Along with all of this, the older I get the more fearful I am about how my lack of fertility will affect my relationships, how it will affect my life in general. While I had managed to accept my appearance throughout college, by becoming invisible and contenting myself to my lack of uniqueness, university dragged up all of my old fears. I would now have to live with people who I couldn’t be myself around. I couldn’t let the hair on my face grow out and walk around my house with my hair in a bun. I couldn’t easily wax, laser or use cream to take the hair off of my face without having to hide it from the 11 other people I lived with. Despite everyone in my house being lovely, my confidence was shot – the girls were all perfect and the guys were sometime clueless about how their words could affect me- not knowing that at 19 I was still overly sensitive about my appearance. All of this was epitomised when I was called in to settle an argument about transgender women: it had been said that a woman is only a woman if she can produce a child and while this argument had nothing to do with my struggle, the comment hurt and I couldn’t help but once again call into question who I was as a person. This is not the only controversial topic that accidentally confronts the issues that arise due to PCOS. Seeing feminist movements in which attractive girls advertise their armpit and leg hair, and encourage other girls to stop waxing does nothing but irritate me because they have no clue what it’s like to live in a society that claims women should be natural, even natural enough to show conventional and normal aspects of being a woman. But if I were to stop waxing I would be looked at as someone ugly and unfeminine, while they maintain their feminine beauty they forget the girls who do not have the privilege to do the same. 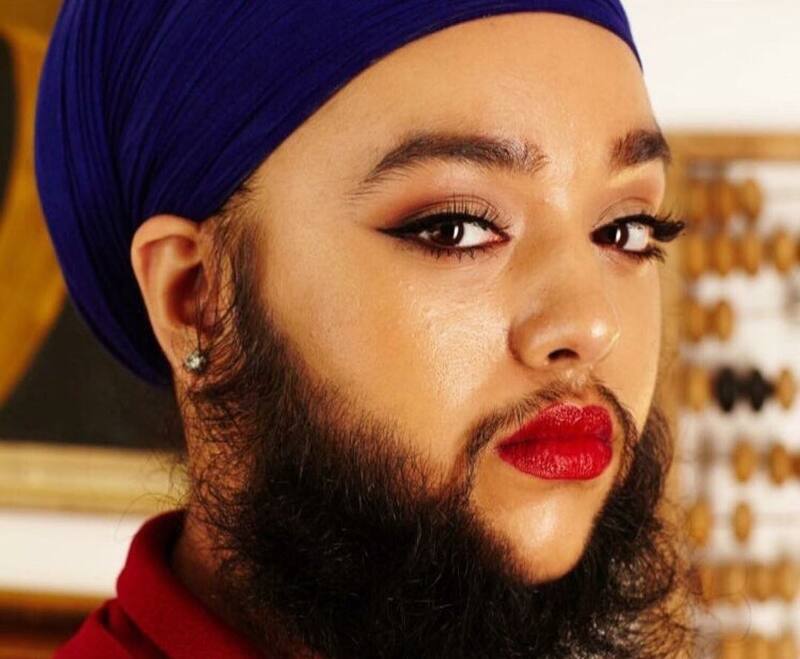 Yet role models are finally emerging, such as Harnaam Kaur, a beautiful and courageous woman who made the book of Guinness World Records for being the youngest woman to have a full beard. Her Instagram doesn’t glamorise the female body as nothing more than the perfect hour glass figure and she is completely unapologetic for being confident in herself just as she is. Instead of hiding such a formative part of who she is Kaur embraces her uniqueness and uses her negative experiences to help others as an anti-bullying ambassador. This is the type of woman I feel we need more of in the world and this is the type of woman I aspire to be like. Now I’m older I try to joke about being the bearded lady with the few people I trust in my life who know about my condition, but there are still days when I don’t want to leave the house because I have to let the hair on my face grow out more before I can have it waxed off again. I still hate people looking at me for too long because I’m afraid they’ll see, despite my best efforts to push down my boyish side, just how masculine I truly look. I hate when anyone cups my cheek because I have to mentally count how many days it’s been since I had the hair torn out or burnt off my face because I know they can feel bristles that they weren’t expecting. And the truth of the matter is I almost didn’t write this because I didn’t want to admit to something I’ve been hiding for years, but I have nothing to be ashamed of and neither do the plenty of other girls who are living with this. PCOS affects 1 in 4 girls, 1 in every 10 have severe PCOS affecting their fertility and so I know I’m not alone, and yet so few people actually know what this is or what it means. It is this lack of openness surrounding something so common that creates an atmosphere of shame but why should I be ashamed for something that I have no control over? Why should any of the women who have to deal with this condition everyday have to hide in their own homes? Hide from their partners? Or ever feel like they couldn’t confidently walk into a room simply because of appearance? We may never be able to change the effects of PCOS but maybe the world can change its view of what it means to be a woman and what it means to be seen as beautiful. Next articleIntroducing... Whenyoung: "Keep going for art, no matter what."